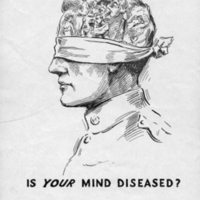 This film puts the syphilis problem in the context of the war. 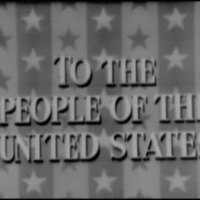 It presents the effects of the illness, statistics about how it affects the war effort, and control principles. Two older men sit having a drink. 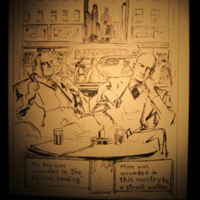 One says, "My boy was wounded in the African landing." The other man, looking disappointed, replies, "Mine was wounded in this country by a street walker." "Will You Go Home With Your Outfit"
"What Kind of Parents Will YOUR Children Have?" 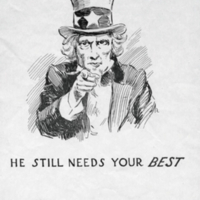 This poster invokes the family to promote continence among servicemen. 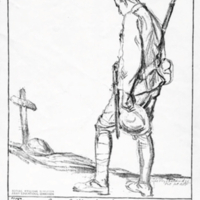 "'To You From Failing Hands We Throw the Torch, Be Yours to Hold it High'"
This poster features an image of a serviceman at the grave of a comrade to promote social hygiene. This poster warns servicemen about prostitutes and encourages continence. 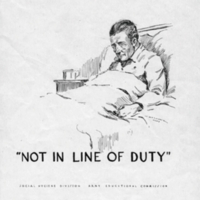 "'Not in Line of Duty'"
"He Still Needs Your Best"
This is a WWI social hygiene poster directed to servicemen. 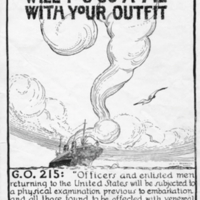 An image of Uncle Same warns that VD can threaten the war effort. 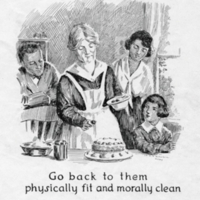 "Go Back to Them Physically Fit and Morally Clean"
This is a WWI social hygiene poster directed to servicemen. It invokes the family who awaits them at home to emphasize continence. 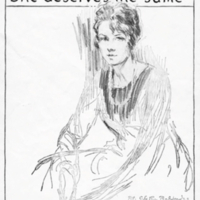 "100%, She Deserves the Same"
This is a WWI social hygiene poster directed to servicemen. It features the image of a wife or sweetheart to emphasize continence. 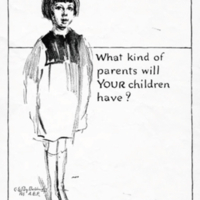 This is a WWI social hygiene poster directed to servicemen. 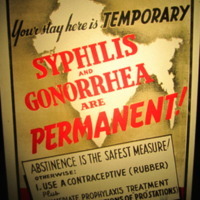 "Your Stay Here is TEMPORARY, Syphilis and Gonorrhea are Permanent!" 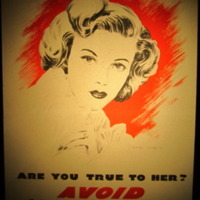 This poster warns soldiers stationed in Asia to avoid VD through abstinence or prophylaxis use. 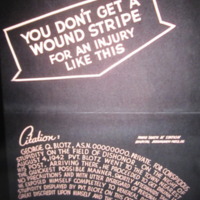 "You Don't Get a Wound Stripe For an Injury Like This"
This poster tells the story of Private Blotz who contracts VD. "She Is True To You! Are You True to Her? 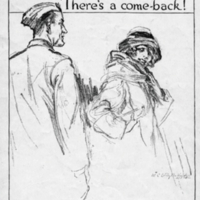 Avoid Venereal Disease"
This poster features an image of young woman and appeals to soldiers to keep their sweethearts devotion and abstinence in mind. 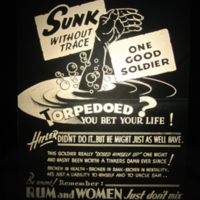 "Sunk Without Trace, One Good Soldier"
This poster shows a serviceman's hand reaching up out of the water and warns that VD hurts the war effort. Part of the "Rum and Women Just Don't Mix Series." "Streamlined for G.I. 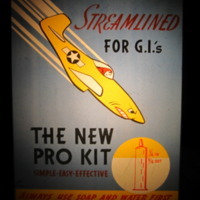 's, The New Pro Kit"
"Simple, Easy, Effective : Always Use Soap and Water First"
This poster advertises that a new prophylactic kit is available for servicemen. 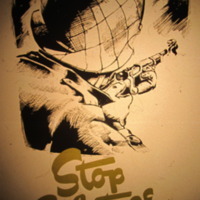 This poster features an image of a soldier aiming a gun and likens contracting venereal disease to sabotage. "I Let 'Em All Down, What a Sucker I've Been!" 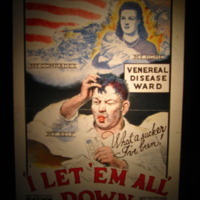 The poster shows a man in the VD ward. He comments that he has let down his fellow soldiers, his family, and his country by contracting disease. 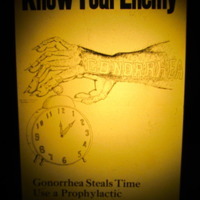 "Gonorrhea Steals Time : Use a Prophylactic : Go to a Prophylactic Station"
A large hand labeled gonorrhea reaches for a clock. 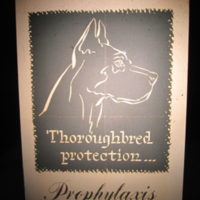 The poster advises audiences to use prophylaxis.